There was a time in our county when farmers grew vegetables, fruit and citrus, berries, had their own beehives and supplied their own beef, pork, and chicken. They had pastured chicken eggs before pastured eggs were popular. They drank raw milk, skimmed cream, and made butter. They baked bread and made pies. People ate what came from their farms…they shared with their neighbors and sold their excess. Life was good and plentiful. Seven years ago when I went looking for some of that homegrown food, it had vanished. I asked one farm market vendor where all the local food was…she pointed to a few jars of honey and said that if i wanted any of it I better act quickly. The honey guy was moving his operation to North Carolina. What was going on? What had happened to all the farm food….food grown, produced, harvested and consumed within our county? There was none…..NONE. That was shocking. 90% of our county is agriculture so I went on a search to find what was being grown and produced and to see if any of it was remaining here for us to eat. What I found was that much of the land is in beef production and citrus crops, both being shipped out of the state for dinner tables all over the country. 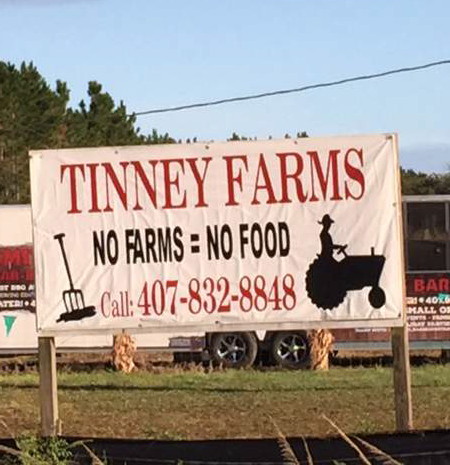 Our county’s small farms had basically disappeared. But what if we could bring them back? If our county spends a billion dollars a year on its food, and if the farms in Osceola could supply 25% of that, think of the money that would stay here…providing jobs to our citizens, fair wages to our farmers, and healthy food to our residents. I read a paper about this 25% shift and how local economies benefitted all the way around. Osceola county is at 0%. Could we set our sights for even a 1% shift? I think we could, and the ground has started moving in that direction. Osceola County Grown was created to help get this shift moving. In 2008, our first CSA (Community Supported Agriculture) program began. A couple of years later we had our first Farm to Fork dinner… serving a meal that had meat from our ranches, and vegetables from our fields and dessert from our berry crops. It was a start. OCGrown is committed to having nutritionally rich foods grown for the vitality and health of our residents. We encourage farming on small lots or acre plots and push for fair wages for our farmers…more farming will bring more jobs to this area. We encourage good growing practices so the land can be remineralized and sustain generations for years to come. The momentum has snowballed into more backyard gardens, more farmers producing for more people, u-pick blueberry fields and u-pick peach orchards are now within our county. We have grass fed beef and chickens that have been humanely raised on pasture land. We have dairy products, jams made with local fruits, breads baked in brick ovens…and local pure honey . I’m indebted to those who have contributed this “shift” in our county….from producer to govt. to consumer. We’re a community dedicated to make our county’s food production plentiful once again.